The 2016 Irish Film Festival will be held Thursday July 28th though Monday August 1st. 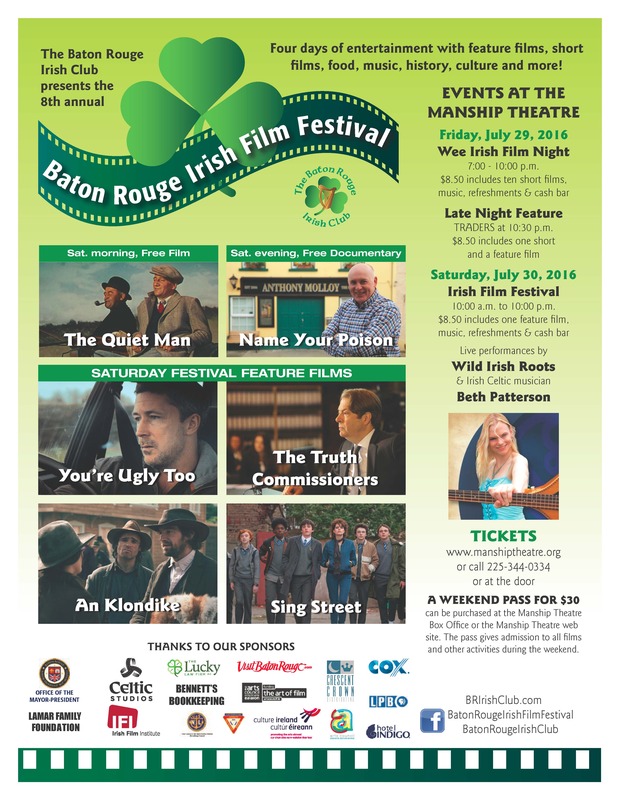 The primary event of the Irish Club held each year is the Baton Rouge Irish Film Festival. This event helps to bring the Irish Culture to the public; where audiences can enjoy a wide variety of newly released films along with fun and entertainment. The festival has grown in scope over the last several years adding more films each year. Wee Irish Film Night is held Friday evening at 7:30 PM at the Manship Theatre featuring a showing of several short films. Audience members are asked to vote on their favorite short with an award presented to the director of the winning film. Then at 10:30 PM there will be a late night Irish film premiere. Then on Saturday, Festival Day, at 10 AM, bagpiper Will Brian will perform on the plaza at the Shaw Center and lead the festivities into the Manship Theatre for the first film of the day. During Festival Day several full-length films are shown and are complimented during the day by refreshments, dance by the Ryan School of Irish Dance, and music by Beth Patterson and Wild Irish Roots. Immediately following the Festival an After Party is held in the lobby of the Hotel Indigo in downtown Baton Rouge. On the Thursday prior to the festival a Sponsors Party at Celtic Studios is held to honor the sponsors of the event (sponsors & guests only). On Sunday, an Easter Rising Centenary Event will be celebrated at Celtic Studios; commemorating 1916 Irish uprising. On Monday, Phil Brady’s Bar and Grill is the host for Irish Pub Night featuring full-length comedy movie and a couple of shorts. Beth Patterson (at 4:20 PM on Sat. ), Wild Irish Roots, and Wil Brian on bagpipes. 7:30 PM Wee Irish Films (film shorts) Click Here for synopses of all short films. Saturday at Manship : Click Here for synopses of all feature films. If you’re comming from out of town book a room at the Hotel Indigo for $99/night – group code IFF (click here).